Like an ageing boxer, the UK’s Data Protection Act 1998 is set to be eclipsed by a new heavyweight that warming up and ready to enter the ring some six months from now. Bigger, tougher, and up for the challenge, few can doubt GDPR is set to pull a good many punches and, possibly deliver numerous knockouts. If only a portion five thousand or so “issues of concern” the UK’s Information Commissioner’s Office (ICO) receives in a year were to metamorphose into valid breaches, there could be many red faces and blooded noses in firms large and small. It’s important to remember GDPR is not just an IT thing; incidents such as disclosure of confidential information from the miss-directed documents in the post, irrespective of the cause, constitute a data breach and can result in punitive fines for company directors. GDPR requires a holistic approach from data controllers and processors to the range of risks facing data subjects face. With the ICO now under the leadership of Canadian, Elizabeth Denham, a veritable grand master of Privacy, the risk of litigation with this body is not for the faint hearted, as a leading UK telecoms provider will vouch. The lessons learned from an October 2015 cyber-attack have resulted in a sea-change in a certain organisations approach to security of data, systems and processes, but at a cost. The ICO’s in-depth investigation found that the attack on the company could have been prevented if the said telco had taken basic steps to protect customers’ information. Along with a growing number of other notable household names, the firm has made significant progress transforming its data security and working process practices through the adoption of BPM methods. Given the clear direction of Ms Denham and the growing number of “tools” available to the ICO to act on the consequences of breaches – whether by human or systems failings, or wilfully nefarious acts by criminals, failed litigation with it would likely come dire consequences for the board of any organisation. The October 2015 incident saw the firms CEO walk the plank not because of the £400k penalty the ICO imposed but due to the mass exodus of customers and reaction of the stock market. GDPR leaves no room for the apparent ambivalence in some quarters. For all organisation touched by GDPR, mitigation is now the watch-word if “litigation” in any way, shape or form is to be avoided. All Data Protection policies must be updated in line with the GDPR guidelines and demonstrably enforced. But, in preparing for GDPR, there is a point at which all but the smallest firms will have to cross the Rubicon as the tasks required to effectively integrate GDPR into the working fabric and IT systems become more involved. The diversity of tasks to be addresses means there is no universal out-of-the-box solution. A major task from the outset is ‘Gap Analysis’. This is the process of identifying where current processes and policies contribute to GDPR compliance or equally, where they create risks of breaches. In either case, risks must be catalogued. At this point, firms may wish to rethink how they document their standard operating procedures (SOPs), the majority of which still exist in written form. Business Process Mapping, a fairly static view of what/who/how and when has been eclipsed by Business Process Modelling best described flowcharts with the intelligence of spreadsheets and databases. In brief, between now and 25 May 2018 we must align many of current operational processes to ensure compliance in a GDPR world. Experience shows that behind any one visible process there is a hierarchy of related and interconnected processes. Text-based procedural documents are best replaced with smart business process models to deliver insight and help reduce risk. With this Rubicon crossed, firms can move on to defining GDPR business processes ideally, automating them. With resources, requirements, and risks documented in a process landscape (using BPMN, the now de facto standard for business process mapping), implementation, whether manual or automated can be easily audited and compliance confirmed. Making this a part of GDPR will not only help firms achieve compliance but will highlight any need for changes to information systems. Organisations currently taking a process centric approach to GDPR report significant benefits from more systematic mitigation of risks and the ability to sustain both updates and control of the compliance landscape. By May 25th 2018 many new obligations and capabilities to fulfil them must in place ranging from consent management, requests about information held on the data subject, the Right To Access and Right To Be Forgotten (to name but a few). Without automation, the resultant workload may be outside of the resources and capability of many of the best-intended organisations. With significant penalties for late responses to information requests such as the GDPR “Right To Be Forgotten”, there is speculation in some quarters that unscrupulous firms are preparing to emulate the claims bonanza now underway in the PPI miss-selling fiasco. If organisations are to mitigate the risks from what might turn into a gold rush on potential bonanza then automation of what would otherwise be human workflows is critical. Given the potential complexity to deliver a technology solution between now and May 25th, it would be reasonable to forecast many firms may be taken to the cleaners unless they recruit the required staff to respond manually (and within the defined time limits). 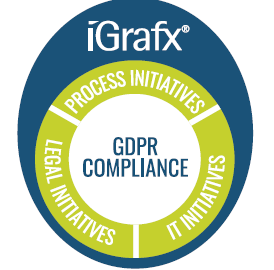 Connecting new generation workflow tools to existing data systems, now possible from BPM solutions such as iGrafx, enables a rapid response to such requirements.